Nikolaj Coster-Waldau is a Danish actor, producer, and screenwriter. He rose to prominence in Denmark for his role in the 1994 film, Nightwatch. He made his film debut in the US in the war film, Black Hawk Down in 2001. He is best known for his role as Jaime Lannister in the HBO fantasy series, Game of Thrones. He has over 1.9 million followers on his Instagram. Jaime Lannister, Kingslayer, knight of the Kingsguard and a member of House Lannister sees Three-Eye Raven Bran Stark, son of Lord Ned Stark in the last minutes of Game of Thrones final season. He arrives North to help Jon Snow and Daenerys Targaryen fight the ultimate battle against the Night King. Upon his arrival, Jaime and Three-Eye Raven Bran see each other. The 48-years old Danish actor Nikolaj Coster-Waldau plays the role of Jaime Lannister. What is Nikolaj Coster-Waldau Famous For? - His role as Jaime Lannister in the HBO series, Game of Thrones. Where was Nikolaj Coster-Waldau Born? Nikolaj Coster Waldau was born on 27 July 1970. He was born to a father, Jorgen Oscar Fritzer Waldau, and a mother, Soborg Coster. He belongs to White ethnicity. He has German ancestry on his father's side. His birth place is in Rudkobing in Denmark. He holds Danish nationality. His zodiac sign is Leo. He has 2 siblings, 2 older sisters, Dorte Coster-Waldau, and Rikke Coster-Waldau. He was raised by his mother and grew up in Tybjerg. His parents later got divorced. He attended Danish National School of Theatre and Contemporary Dance in Copenhagen. He was the youngest actor to enter the Danish National School. He graduated in 1993. Nikolaj Coster-Waldau made his stage debut as Laertes in Hamlet in 1992. He has appeared in numerous stage plays since then. His stage plays are Morgen og aften, Privattiv, I en Fremmeds Ojne, Paradis, Lovestory, Drengene I Skyggen, Becket, Ojeblikket, Macbeth, among others. He made his film debut as Martin Bork in the 1994 film Nightwatch. He appeared in numerous Danish films such as Hemmeligheder, Wildside, Nattens Engel, The Cable Club, Misery Harbour, Pa fremmed mark, and Enigma. He made his British debut in the 1997 film Bent. He made his Hollywood debut in the 2001 film, Black Hawk Down, where he appeared as Medal of Honor recipient Gary Gordon. His other films are 24 Hours in the Life of a Woman, Stealing Rembrandt, The Bouncer, My Name is Modesty, The Good Cop, Wimbledon, Kingdom of Heaven, The Headsman, Firewall, Triple Dare, The Baker, The Kautokeino Rebellion, At World's End, Blackthorn, Headhunters, Mama, Oblivion, A Thousand Times Good Night, The Other Woman, A Second Chance, Gods of Egypt, Small Crimes, Shot Caller, among others. He was the executive producer and starred in films, 3 Things, Upstart, Aurum, and Himmerland. His upcoming films are Domino, Suicide Tourist, and Notat, all scheduled to release in 2019. He landed one of the main roles as Jaime Lannister in the HBO hit series, Game of Thrones in 2011. His role as Jaime Lannister earned him global recognition. He has appeared in all 8 seasons of Game of Thrones. He has appeared in other television series such as Lock, Stock..., New Amsterdam, The Left Wing Gang, The Simpsons, among others. He has appeared in television films, Slaget pa taskem, Jacobs liste, Filthy Gorgeous, Virtuality. He was nominated for numerous awards for his role in Game of Thrones. He was awarded Empire Hero Award (shared with the cast) for Game of Thrones in 2015. 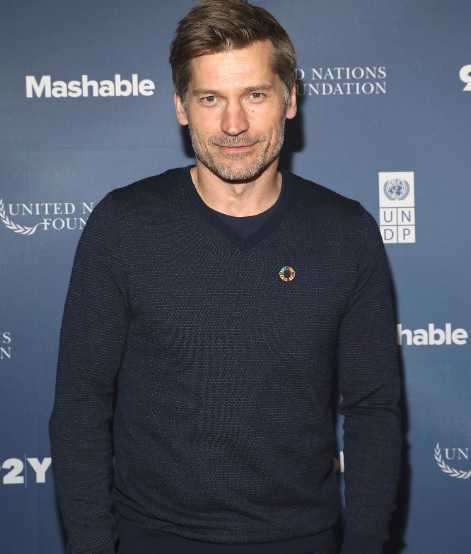 He was awarded the Ove Sprogoe Award in 2017.
Who is Nikolaj Coster-Waldau Married to? Nikolaj Coster-Waldau is a married man. he is married to Greenlandic actress and singer, Sascha Nukaka Motzfeldt. The couple got married in 1998. The couple has 2 daughters together, Filippa, and Safina. The family lives in Kongens Lyngby. The couple has 2 dogs. 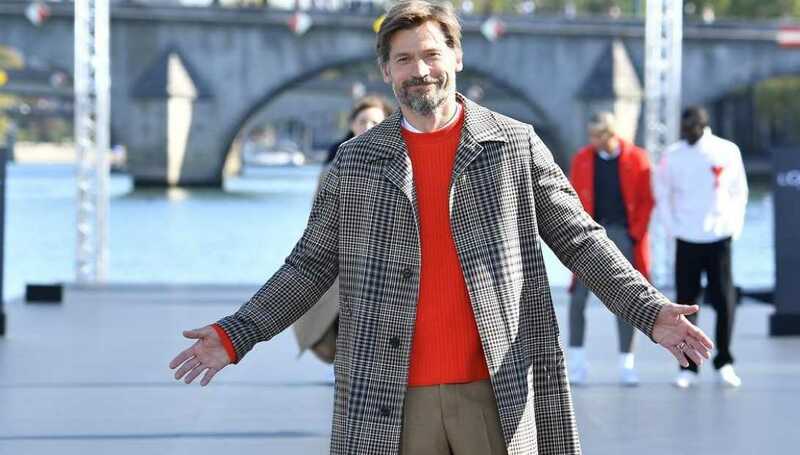 What are Nikolaj Coster-Waldau's Body Measurements? Nikolaj Coster-Waldau stands at a height of 1.88 m i.e. 6 feet and 2 inches tall. He has a body weight of 192 lbs i.e. 87 kg. He has an athletic body build. He has a chest size of 43 inches, biceps of size 16 inches, and a waist size of 34 inches. He has blue eyes and his hair color is blonde. What is Nikolaj Coster-Waldau's Net Worth? Nikolaj Coster-Waldau earns from his acting career. He started his acting career from the stage and later starred in Danish films before moving to Hollywood. Working in the entertainment industry his major source of income. As of 2019, his net worth is estimated at $16 million. His daughters, Filippa, and Safina are also actors. His father-in-law, Josef Motzfeldt is a member of the Parliament of Greenland and former leader of the Community of the People party. He is a supporter of English football club Leeds United and also the member of the Leeds United Supporters' Trust. He is the narrator of one of the fairytales for GivingTales. He has been supporting the Danish Red Cross since 2003. He organized a Game of Thrones campaign-contest in 2016 in order to support the RED foundation. He has been appointed a UNDP Goodwill Ambassador since September 2016. He partnered with Google in 2017 using Street View to document the impact of global warming in Greenland. He participated in a female empowerment initiative in Kenya on the occasion of International Women's Day in 2017. He was one of the speakers in The Spotlight Initiative, a European Union-United Nations action to eliminate violence against women and girls. He was one of the several other Danish artists to sign a manifesto in early 2018 demanding zero tolerance for sexism, sexual harassment, and sexual assault in the Danish film and stage arts industry. He kicked off The Lion's Share fund's launch in June 2018 where the advertiser will donate 0.5% of the paid media spending of an advertising campaign to the fund if the campaign uses an image of an animal.